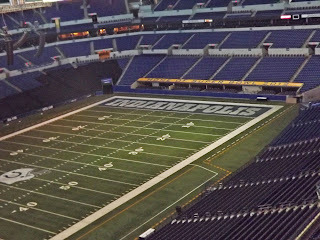 I had a great trip to Indianapolis in September and discovered some of the plans the city was making to get ready for the 2012 Super Bowl. I couldn’t wait to return to the city and I had my opportunity when I received an assignment from American Way Magazine. Once I was there I had a chance to explore some more things to see, do and eat. Evan of the Indianapolis Convention & Visitors Association met me in the lobby of the brand new (and largest in the world) J.W. Marriott to take me for lunch. We were heading to Goose The Market, where the owner has a passion for charcuterie, combined with a taste for interesting wines and beers. Goose the Market is famous for their bacon, and even has a Bacon of the Month Club (Apple Cider and Brandy, anyone?). 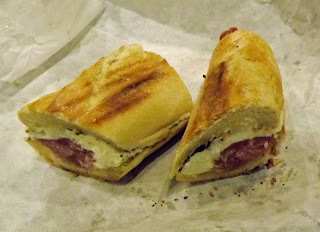 They offer a few different sandwiches each day and I settled on The Goose, made with Prosciutto di Parma, basil, fresh mozzarella and extra virgin olive oil. I only had a few bites of the delicious concoction when we were also given some fresh cheese and meat platters, with treats such as Midnight Run goat’s milk cheese, tomato preserves, Calibrese (100% pork with paprika) and a homemade Black Forest Ham. It all went down very well with a glass of Australian Semillon, one of nearly 100 types of wine they have in addition to at least 60 beer choices. 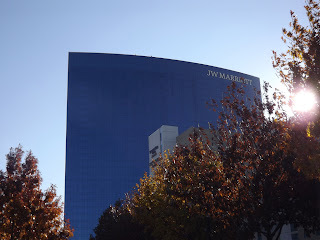 After lunch, Evan took me through town and told me about the Sky Walks that connect the Convention Center, Circle Centre Mall and a dozen hotels to Lucas Oil Stadium so almost everywhere you go in Indy (including Lucas Oil Stadium) can be reached in climate control comfort. We also drove by a few of the murals being designed in the 46 for XLVI project done by the Arts Council of Indianapolis before I was dropped at Studio 2000 for a massage. 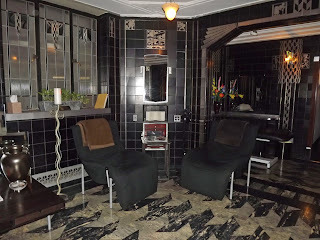 I enjoyed the massage, but I also liked the nostalgia of the place in the Circle Tower, which has great views of Monument Circle available to those getting their hair done. 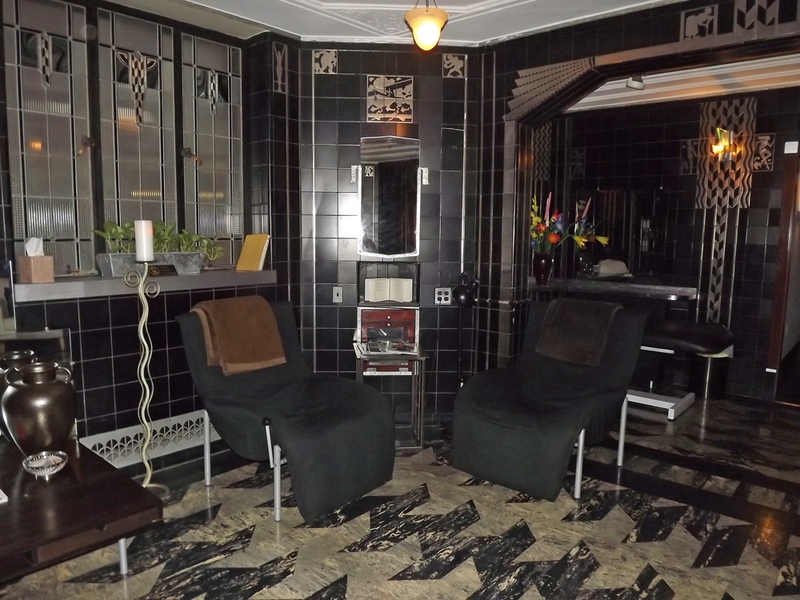 It’s full of nifty nostalgic pieces, such as remnants of the architectural firm it was in the 1920s and chairs from the barbershop it then became. Cocktails were at a new establishment, The Libertine. Neal Brown, a well-known Indianapolis restaurateur, just opened this place with a focus on cocktails and small plates. (This is another meat lovers paradise, they have a Bacon Flight on the bar menu!) The bartenders are knowledgeable and make suggestions. I had a Dark & Stormy with Goslings Black Seal and Evan enjoyed The Vesper, a James Bond favorite made here with Billicoat Gin, Penin Vodka and Lillet Blanc. 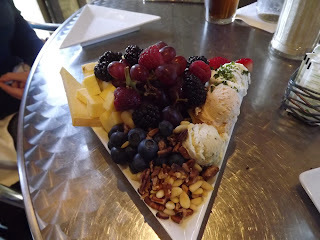 We had a delicious dinner at the elegantly comfortable Meridian Restaurant. I was really impressed with the preparation of Chef Dan Dunville and it appears I’m not alone as Indianapolis Colts like Peyton Manning make this place a regular stop. I settled in with a glass of the 2009 Babich New Zealand Sauvignon Blanc and a dish of Potato Gnocchi with mushrooms, tomato, bacon, spinach, golden raisins and squash. It was absolutely delicious and hard to top when the Osso Bucco and the Wild Boar Parpadelle came, but we did manage to enjoy it all, even sampling a little of the unbelievable desserts, which included a Banana Tart with Macadamia Nuts & Caramel. After a good night’s sleep, Morgan from the Visit Indy picked me up and we talked some more about the upcoming Super Bowl. I learned that this event will have more possible NFL competitors within a five hour drive than any in history. A Super Bowl Village will be created for 10 days for parties and activities, including zip lining through the streets. Madonna will be singing at halftime and a host of other celebrities will be attending and performing. In all, the city expects 150,000 people – and only half will be in the stadium. I was rather excited about the prospect of heading into a private tour of Lucas Oil Stadium and was quite impressed. 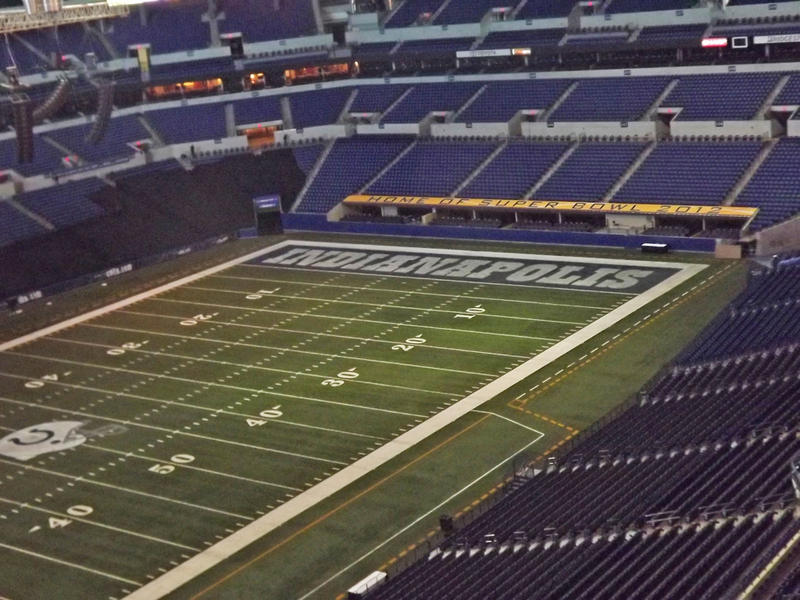 There’s something about standing in the middle of this huge empty place that just currently has a “Home of Super Bowl 2012” sign and will have the attention of millions from around the world in a few months. We took a walk through White River Park, which is home to eight museums and lots of activities in the spring and summer, including gondola rides through the canal. 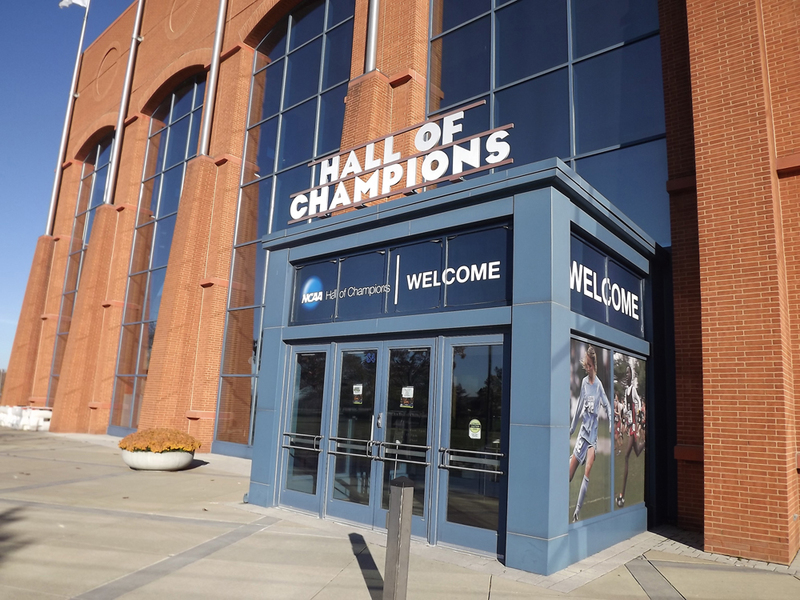 I dedicated a good part of my career to writing fulltime about tennis so I loved a walk through the NCAA Hall of Fame. I was able to spot quite a few names recorded in there of players I know, including the dedication to the last school to sweep singles, doubles and team championships, my very own Fighting Illini (2003). Before heading home, Morgan and I had a wonderful lunch just outside of town at Trader’s Point Creamery. 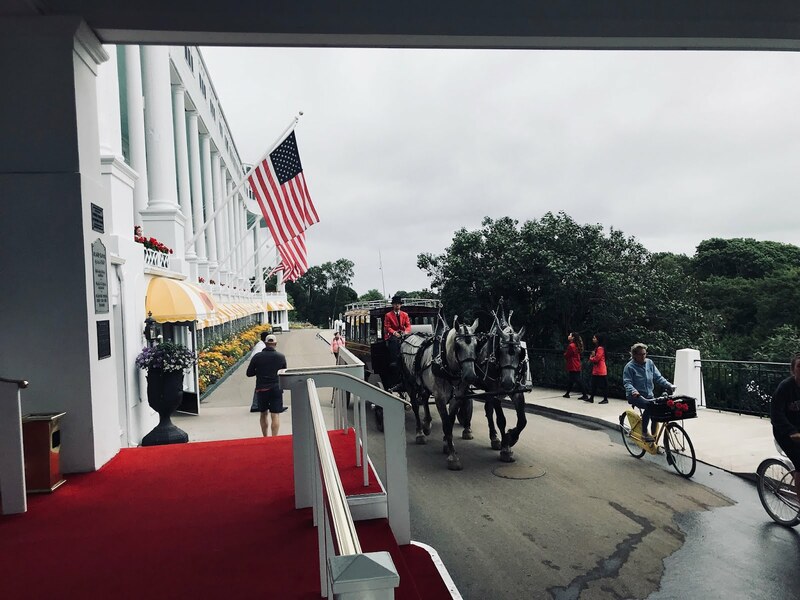 It’s a great place to bring the kids (or be a kid with sleigh rides and caroling) through the farm, but it also has a phenomenal restaurant attached. I had some of their famous hot chocolate and a grilled cheese sandwich with avocado. 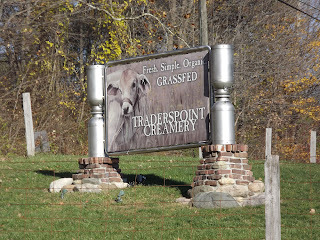 Lindsay, the cheese maker, came by with some delicious samples of Gouda, raw milk cheese and feta, then we finished it up with a bit of their homemade ice cream (caramel and chocolate make a wonderful combo). I’m not sure yet if I will make it to any of the festivities for Super Bowl 2012, but I will certainly be back. 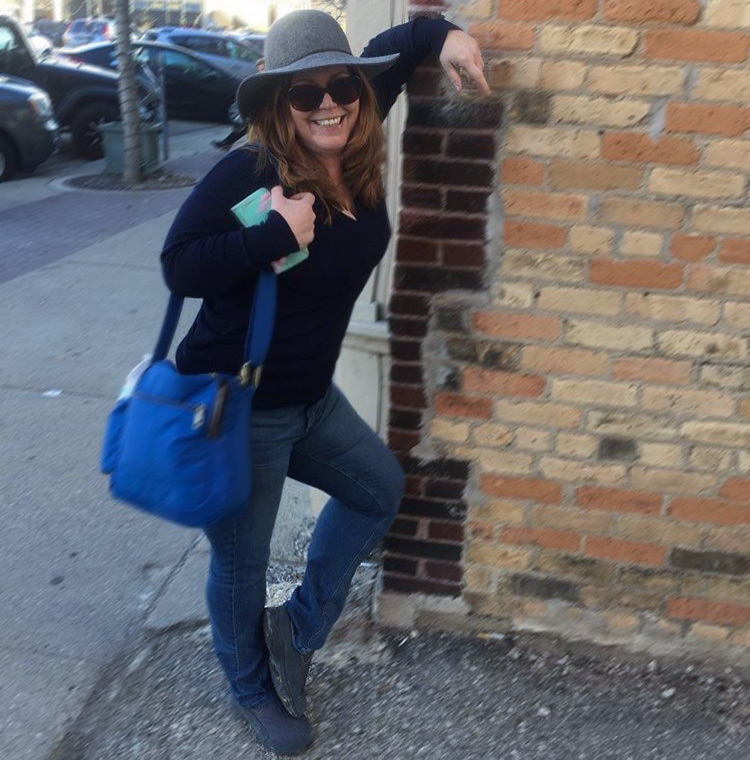 One of the reasons I moved to the Midwest was the fact that I would have the opportunity to visit so many places nearby without worrying about traffic and tolls. 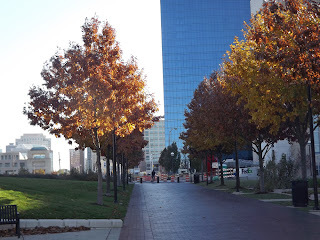 Indianapolis is definitely one of those cities and I have a feeling there’s a lot more to discover there.